Come to this year’s Section Conclave to meet Arrowmen from all around our section for a once in a lifetime opportunity. Our section includes 4 different states and has 7 different lodges. People from all around these areas will be coming to this event to witness “The Greatest Show on Earth”. Many of the summer activities the ranch has to offer will be available during this event. You will have the opportunity to go rock climbing, shooting, mountain biking, tubing, skiing, and go to the famous Huck’s Cove waterpark! Not only will we have these events be open, but we will have ton of other activities available that you’re not going to want to miss! And on top of all the activities to keep you busy, we will be having a big outdoor concert and huge show (THE GREATEST SHOW ON EARTH!). 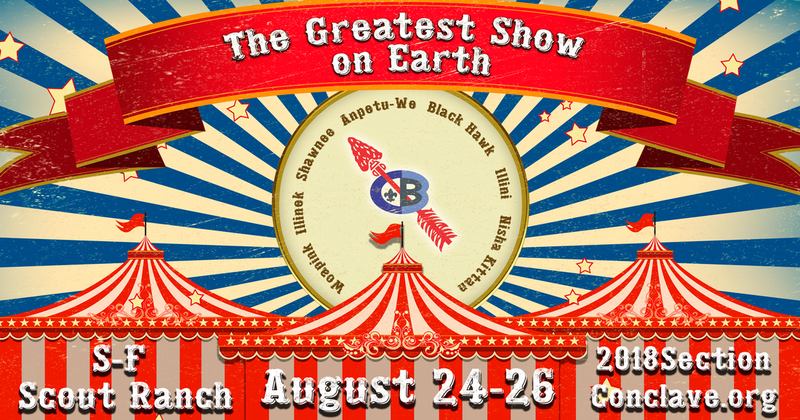 Come down to see unique shows that have never been done at the Ranch before! In addition to hundreds of Arrowman from around our section, there will also be numerous National Officers in the Order of the Arrow. Some of our special guests include the National Vice Chief Michael Kipp, Central Region Chief Will Coots, and many past Section, Region, and National Officers. They will be around all weekend to hangout and have fun with the arrowman of our section. Even though fun activities can be a blast at a weekend camp, there will also be a variety of trainings happening. These classes will be taught by some of the best trainers around the nation. These trainings will include native american culture, leadership, ways to improve your lodge, and many more! Native American culture has always been a tradition passed on through the OA. Between the ceremonial team competitions and the Native American dance competitions, Section C-3B strives to keep the traditions alive! Come with your ceremonial or dance team to compete against people from all over our section to win big prizes! In order to go to an event this big and fun, it is important that you sign up now! BUT, to make it a little more enticing to sign up soon, if you sign up before the month of July ends, we will be giving you a free ticket to our Fall Reunion. YES! You heard that correctly! Sign up for Section Conclave within the month of July, and you will get to go to Fall Reunion for FREE! Now you may be asking how you can go to this once in a lifetime event. Signing up is simple and easy. Go to 2018sectionconclave.org to sign up or find the link on our council and lodge website. On behalf of the entire Conclave planning team, we are excited to see you at the ranch to truly experience The Greatest Show On Earth! Once this promotion closes, you will receive a link to register for the Shawnee Lodge Fall Reunion for FREE! Includes all meals, cracker barrels, activities, shows, and trainings. *Pre-Ordeal Candidates are welcome and encouraged to attend this event!